With yet another type of diesel locomotive consigned to the history books we pay tribute to the sterling work undertaken by the Doncaster built Class 58 diesel electric locomotives. 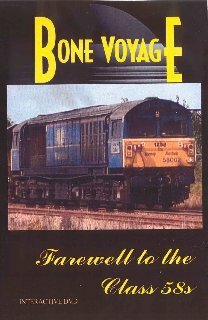 This collectors item, featuring rare and in some cases unique footage of the Class 58s, is complimented by sights of them at work on their regular duties. With scenes ranging from Cornwall and Kent to the North of Scotland we see these popular Type 5s on freight duties, top link passenger work,’ electric ‘drags’, and railtours. Features all 50 locomotives and the whole range of liveries carried.